Bubba’s Gift from Humboldt Seeds mixes two legendary indicas into an instant classic. Although Bubba’s Gift enjoyed a quick rise to notoriety within the cannabis community (especially for those in the US), she was actually the result of a happy accident, with her creation never intended. She is the mix of pre-98’ Bubba Kush x God’s Gift, and as Humboldt Seeds tells it, was conceived when a male Bubba Kush somehow made its way into a flowering room, half filled with female Bubba Kush, and the other half female God’s Gift. While initially dismayed when they discovered what had happened, the seeds produced actually resulted in a very promising strain, leading the breeders of Humboldt to spend the next few generations stabilising, honing and perfecting it. She remained a well-guarded secret until her release under the name Bubba’s Gift – the well-rounded indica powerhouse we know today! So, how does she grow? Well, we found she was quite a slow to get going, but picked up speed after a few weeks of vegetative growth. 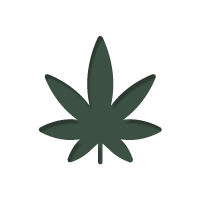 Being indica dominant, she grows with a compact stature, but with enough spacing to allow for decent light penetration through her fan leaves. As she flowers (which took about 7 weeks to complete), she produces some very dense, hard nugs all the way up the plant, as well as some glorious looking, frosty, resin covered main colas. She is not the biggest yielder, but the quality of her bud (which we will get into in a minute) far outweighs this concern. 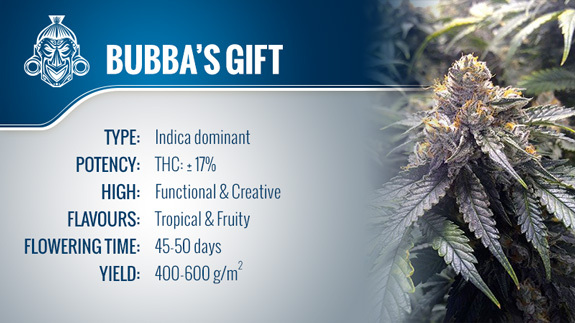 As such, Bubba’s Gift is without a doubt a connoisseur strain, prioritising top-shelf bud over raw production power. As Bubba’s Gift is such as fast flowerer, growing her outdoors can be quite tricky. She needs a late start, such as towards the end of May or beginning of June, to ensure she doesn’t peak too early. So, onto the bud itself. The first thing to mention about Bubba’s Gift is that her flavour is pungent. As such, she will stink up any grow room without a second thought the moment she starts flowering. The flavour is dank and spicy, riding a strong exotic, fruity overtone, melded with a little bit of diesel/fuely goodness. Definitely a strain for those who like to tantalise their palate. Combined with an awesome flavour is a potent, but extremely functional high. Bubba’s Gift lifts the mind with motivation, energising the spirit and lowering social inhibition to create a very pleasant getup and go experience. It makes her ideal for when you want to get things done, are looking for a bit of inspiration, or are hanging out with friends. Bubba’s Gift is a treat for the senses. Although she may be a bit slow to get started and only yield a medium amount, she makes up for it with her quick flowering time, insanely powerful flavour, and potent, heady high. There are few who try Bubba’s gift and end up disappointed – she is a true sensation!